Always wearing a smile and speaking courteously is how Sushantho Bose, 23 years, appears to be. His IQ was assessed only two years back which put to rest speculation on his remote memory and inability to make simple calculations. He was assessed with an IQ of 58 with mild to moderate intellectual challenges. Belonging to a middle class broken home, living with his grandparents in Bangalore, and his mother earning a living in Bahrain silenced him, gradually driving him towards unacceptable habits. That was his solution to rejection which he faced multiple times through his childhood from a variety of schools. At the age of 18 he worked long hours at a Dental Laboratory in Hyderabad. His mother attempted to use this as a solution to keep him occupied, but this too, did not help. In February 2017 he travelled back to Bangalore to his grandparents and was introduced to the Saadhya Special School, Ballari, through the net. Sushantho is a resident here. He showed an inclination towards Athletics, Basketball and Powerlifting. For the World Summer Games 2019 he has been selected in Powerlifting. Sushantho visits the gym daily for two hours in the morning and evening. In a Powerlifting event held in Mumbai he competed with 250 mainstream power lifters, securing a third position for himself. 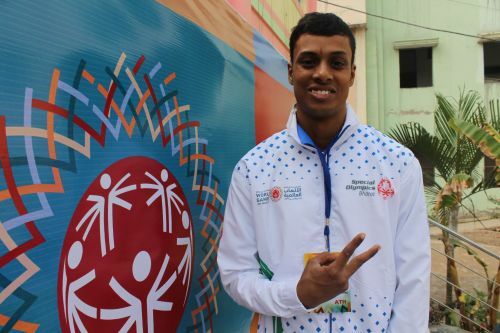 His participation in the Special Olympics sporting events gained him visibility while strengthening his abilities and bringing in discipline and structure. He is currently employed with Evolve Back Luxury Resort, Kamalapur, Hampi where he will be, eventually, entitled for all pays and perks as per Labour Law, once he has completed the probation period. “ There was a time when Sushanto gave in to bad habits. But today he is trained enough to compete alongside mainstream players too. Special Olympics and Saadhya Trust added control to his life”.